The shape of the M in the MO-Labs-Logo is quite special and closely related to the subject of this blog. It belongs to a surface with a so-called cusp singularity, sometimes also called A4-singularity. Singularities of surfaces are very special points. In most parts of a surface, the shape looks quite smooth, but in some it might not; such points are likely to be singularities. An A4-Singularity, height: 81mm (3.2in). 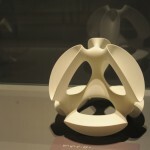 Deformation of an A4-Singularity, height: 81mm (3.2in). A Deformation of an A4-Singularity, Day 8 in the Advent Calendar of Geometrical Animations 2006. By Duco an Straten and Oliver Labs.